Riding Monument Valley- UT. and Mystery Valley- AZ. This area has been the setting for more western movies than any other site in the U.S. Unique sandstone formations And the Navajo Nation Indian Nation define this vast, open desert region. to set up this Vacation By Horse Back. Goulding's Tour Guide " Dennis Tsosie"
seen to all our needs..
from the campsite to guides and scuttles. at the Goulding's world renowned camp grounds. and all up close BY HORSE BACK OF COURSE. as only the Navajo know. and became like a brother to me. A friendship I will always treasure. Took us on a Jeep tour of Monument Valley and introduced us to Susie Yazzie. Susie showed us her skills as a Rug weaver...and done up one of the riders hair in a Navajo BUN. This 90 plus year old Navajo lady is truly remarkable. We shared several Authentic Meals with the Navajo people. Navajo Tacos....Now that's my kind of food.... 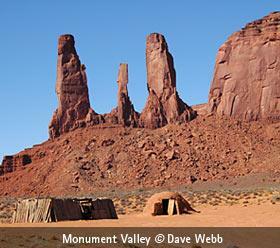 The Monument Valley High School supplied hay for our horses as well as the a sheep for one of our Navajo Meals. Navajo Flute player "Lorenzo Begay" Played several songs just for us in the Hogan Rock formation..
"Patrick Cly" or "our drummer boy".. as I called him, chanted and drummed in the Hidden Arch...Authentic Navajo songs..
Navajo Silversmith "Emmanuel Gray" Demonstrated his work..
"Lucy Fatt" Fixed one our riders hair up in a Navajo Hair Bun. Bill and Navajo Guide Larry Holiday stopped to shared a morning sunrise prayer. All riders Joined in as Larry lead them in a Navajo ceremonial Prayer, to bless their travels and give thanks for all the Beauty around all of us. The Navajo People revere the Horse, they feel as I do there is no better way to show their lands, and culture then by horse. Horse people meeting horse people joining together to see a side of ones lives most do not see. Seeing a culture as it is and bringing that back to be shared by many more. For Over three years I had been working with the Navajo elders arranging this project. My passion was to share with others the beauty, spirit and culture of the people and of this magnificent land. We felt we became a part of the Navajo, as we were on their lands and sharing with them their culture. Our Navajo guides took us to places most outsiders never get to go. We seen the best, as I, Bill Porter was filming for a promotional DVD of the area to promote and enhance the Navajo Nation for the benefit of it's people for generations to come. 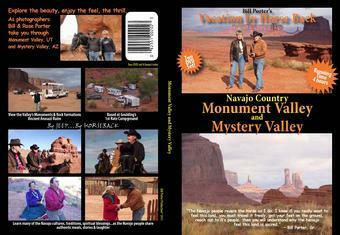 Available March 2011 ...Monument Valley and Mystery Valley a two DVD set..Order Now !! Just click on Pay pal Button below. Monument/Mystery Valley.. Under the Big Eagle and clicking on movie buttons. as I "Vacation By Horse Back"